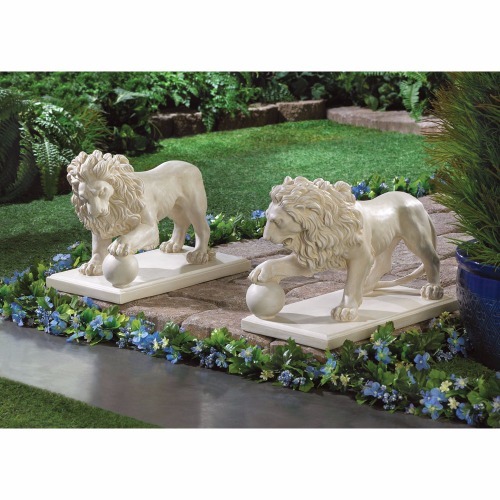 Regal Lion Guardian Garden Statue Set. You have to have a love for the wild life of lions, the way they control an area as their domain. With this lion set we have two lion statues to protect your domain as they protect theirs. With paw perfectly poised atop an orb, this matching pair of magnificent lion statuary will guard your garden or walkway and add a regal flair to your kingdom. This would make the perfect gift family and friends. Imagine this gift in a your home or office or resort or garden. Dimensions	16" x 8.5" x 12"